Description: NATURALSOLUTIONS.COM is a business categorized under nutritionists, which is part of the larger category offices of health practitioners nec. 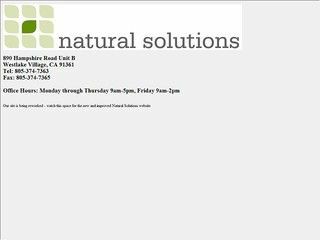 NATURALSOLUTIONS.COM is located at the address 870 Hampshire Road # East in Westlake Village, California 91361-2826. The Owner is Melissa Metcalfe who can be contacted at (805)374-7363.